The most popular green roof for single family residential use is the extensive green roof. Its lightweight attributes minimize the amount of structural changes needed to create it. The extensive green roof is not designed for situations where there is a lot of foot traffic and it is not well suited to growing vegetables. You might find though, the benefits of an extensive green roof make it a very desirable addition to your existing structure, or one that will fit well with your new construction plans. Extensive green roofs use a very shallow growing medium to support plants in the grass and sedum families. They fit well on roofs with shallow to moderate slopes (flat to 4 inches in 12 pitch) and they offer you some distinct advantages that you are not going to get with any traditional roof. You can also use these green roofs on sheds, garages and other outbuildings. In fact, many times these buildings are perfect since their framing is often already exposed and can be easily assessed and reinforced. 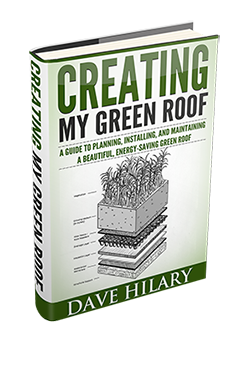 Green roofs have a a positive effect on your heating and cooling costs. It’s not so much because they add insulation but rather because of the way they work with the environment. The plants form a thick mat of living tissue and the leaves transpire, or breathe. As they do that, the air around them stays cooler on hot days. The fact that they are more naturally reflective than many standard roofing materials adds to their cooling effect. The extensive green roof uses a shallow growing medium that absorbs moisture. In cold climates that trapped moisture freezes and creates a barrier to air infiltration and to any air that is colder than 32 degrees F. On more moderate fall and spring days, the plants, growing medium and other components slow down the transfer of heat and cold from the roof to the environment. You will also find that an extensive green roof, when installed and maintained properly, will add years to the life of the roof. The components and plant material reduce the effects of the sun’s ultraviolet light. 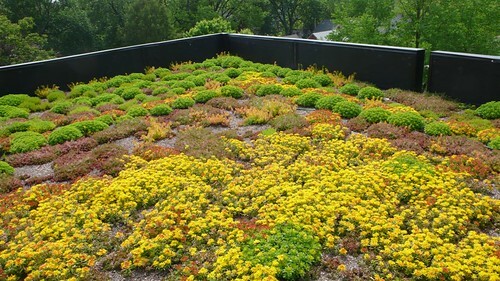 Extensive green roofs slow down the runoff from the roof during rainy periods. Not only that, when the water does runoff it is already filtered through the growing medium making it cleaner than water that flows off a typical roof covering. Green roofs are aesthetically pleasing and they provide habitat for the smallest creatures of the planet as well as for birds. The typical extensive green roof relies on a series of components beginning with a properly reinforced roof. On top of that you add a waterproofing membrane, followed by a drainage mat. The drainage mat has dimples on its underside that creates an air space where excess water can flow away to the roof edges. Next comes the moisture retention blanket followed by the growing medium and plants. There are a variety of growing mediums and some even come already seeded. Others are similar to sod with the plants already growing. Extensive green roofs put a little bit of nature over your head while they protect your roof and help with utility costs. With the right planning, and a bit of hard work, one of them could be in your future. Can my Structure Support a Green Roof? Intensive vs Extensive Green Roofs: What’s the difference?